﻿ Goodstay Dawoo Resortel, Gangneung-si | FROM $56 - SAVE ON AGODA! Have a question for Goodstay Dawoo Resortel? Located in the lovely area of Donghae East Side Sea, Goodstay Dawoo Resortel enjoys a commanding position in the romance, beaches, sightseeing hub of Gangneung-si. From here, guests can enjoy easy access to all that the lively city has to offer. Also within easy reach are Wangsan Johyung Yonguso, Jeongdongjin Beach, Tongil Park (Unification Park). Take advantage of a wealth of unrivaled services and amenities at this Gangneung-si hotel. 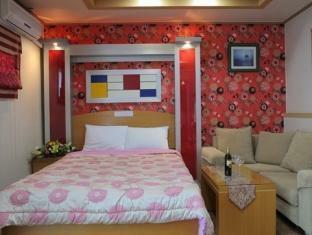 While lodging at this wonderful property, guests can enjoy car park, room service, elevator. Step into one of 49 inviting rooms and escape the stresses of the day with a wide range of amenities such as air conditioning, desk, fan, internet access – LAN, television which can be found in some rooms. The hotel offers many unique recreational opportunities such as garden. With an ideal location and facilities to match, Goodstay Dawoo Resortel hits the spot in many ways. Our 2 nights stay was nice and the room had nice wooden floors. Balconie with small table and chairs was nice to have breakfast or drinks at night. There is no restaurant in this hotel but there is a small kithchen so you can cook if you want or buy some instant noodles at the reception for a quick meal.